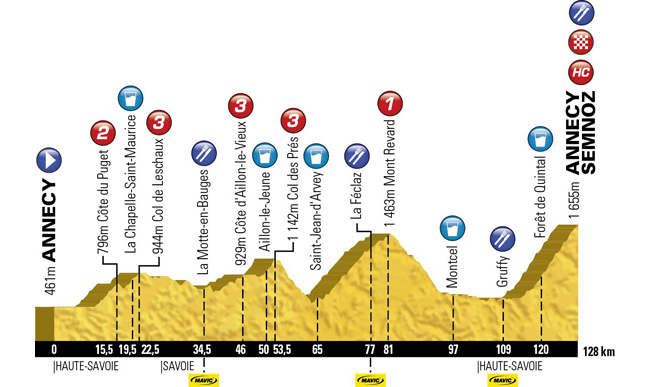 The Etape du Tour is a mountain event with around 6 identified difficult stages and 3600 m of ascent. Whether or not you achieve your goal will be determined by your capacity for endurance youre your climbing skills, especially at the end of the route with the ascent of Mount Revard and the final climb up Mount Semnoz. The main thing to keep in mind is that you should prepare this event by concentrating on endurance training: 130 km for 4 hours 30 mins to 6 hours 30 mins of exercise, as well as preparing for a series of long efforts such as mountain pass climbs. Whats more, this is a group event where your organization will be vital to your success. The start is in a group one. Stress, excitement, the crowds can sometimes cause you to lose your bearings. Generally speaking, your senses are your best bearings, your feelings are there and its not unusual to put a lot into the first kilometres without really thinking about what follows. Its the first thing to avoid because even if you refuel well, using too much energy at the beginning can have an impact on the last hours of the event. To avoid this, try to follow groups with your level. If youre overdoing it, you should let go. Youll regain your positions one by one in the last two ascents. which are often not easy enough to digest during an event as difficult as the Etape du Tour. Generally speaking, I advise taking along your own solid food. Ideally, you should test products and tastes during the preliminary events so that therell be no surprises. Hydration is as important as solid food. You can have a euphoric sequence, followed by a sequence where your legs are no longer with you. The main thing is to balance this out and to analyze it well so that your motivation and commitment dont fluctuate. In general, use the groups in the valleys and the descents. Even if you feel that you could go more quickly, the energy used is too much in proportion to the time gained. On the contrary, during ascents, especially during the last two, concentrate on your feelings, your speed. Each ascent should be an individual effort, as if you were racing against the clock. Pay attention to your cadence. Try to be at a comfortable level right from the start of the event. Bad gear changing can lead to your muscles getting tired too quickly. To conclude, the Etape du Tour is a popular, and crowded, event. Dont let that spoil this for you, concentrate on your route and the pleasure will be even greater.